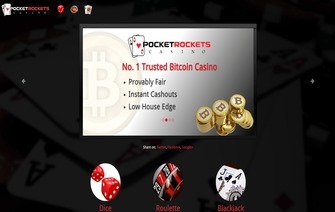 On April 3rd, 2013, PocketRockets Casino (pocketrocketscasino.eu) was introduced to the Bitcoin gaming community as a site for players to wager Bitcoin on three of the most popular casino games that included blackjack, poker, and dice. Since its introduction to the Bitcoin gaming sector, PocketRockets has continued to excel in customer service and provide players a safe and reputable place to wager Bitcoin. Although the poker room has been removed from the original PocketRockets website, they have replaced the poker room with a roulette game, while keeping intact the blackjack and dice games. PocketRockets also participates in providing players great promotions and rewards, alongside contests and other perks that players can partake in. PocketRockets also has provided an investment opportunity for both players and non-players for their dice game. Now online for over two years, PocketRockets has established itself as one of the premier places that the Bitcoin community can trust, and also enjoy being able to wager without any doubt with the security of their Bitcoin. The games that PocketRockets are very easy to remember since there are only three that are provided, up to this point. However they are three of the more popular casino games on the market and each use the “provably fair” verification for players to take security in. Blackjack, dice, and Roulette are the three games that PocketRockets offer and each offer smooth gameplay for players participating in each. Each game also has a specific chat room that players can use to communicate with other players and administrators while they play. Included within each game, is a live feed of each bet that is placed and the result of that bet, in real time. For players that are new to Bitcoin gaming or any of the games that PocketRockets provide, a Bitcoin faucet was implemented by PocketRockets that let players receive a small amount of Bitcoin to play with. The faucet incrementally increases as players continue to wager, all the way up to .0001 of a Bitcoin, the highest faucet amount that is provided at any Bitcoin casino, today. Although the quantity of games is most likely one of the fewest number of games players will find, the quality of the three are what has kept PocketRockets online and running since its introduction, and are easily playable across most platforms. “Pocket Rockets Casino allows a player to invest in the house bankroll, the funds that players bet against. By investing in Pocket Rockets Casino a player will increase the bankroll and also the maximum profit a player can win per bet. This attracts more players. Players will receive a share of the profit the site makes from player losses. But you will also share the loss when a player wins. Our minimum investment is 0.1 Bitcoin. Currently, a player investment will only be used for the dice game but in the future, players will have the option to invest in the bankroll used for other site features. The dice game has a 1% house edge which means in the long run the site expects to make a profit of 1% of the total wagered amount. In the short term, the house can still lose money due to variance. If a certain player makes a lot of large bets, the house can win or lose more than the expected 1%. As explained above, while investing is completely optional for everyone it does provide another way that PocketRockets provides an added service for the Bitcoin community to be a part of. Banking at PocketRockets is set at the industry standard, by today’s terms, with both deposits and withdrawals. Like most of the Bitcoin casinos a player will find, deposits take one confirmation to be credited to the players account, while most withdrawals are processed instantly. The only exception to the instant withdrawal is if the live wallet that processes the payments does not contain enough Bitcoin for the payout to be processed, in which case a payout may take up to 12 hours. While this rarely happens, this is the only delay to players receiving an instant withdrawal. The support that PocketRockets provides is exceptional, due to the many ways of open communication they provide. Whether by email, forum, their own chat rooms, or even through social media like Facebook and Twitter, players are able to communicate any issues or problems that arise. As a test, we sent an email and got a response, within the hour, knowing that was one of the more inefficient ways of submitting a player inquiry. The support is professional, helpful, and quick at PocketRockets. PocketRockets uses the “provably fair” game verification for each game and hand played, which makes both the player and PocketRockets able to verify wins and losses. This is the industry standard. As two years have passed since the opening of PocketRockets, it has not failed to impress players on the validity and trust that it provides. Although the game quantity is extremely low, PocketRockets makes up for it by ensuring both players and investors that it intends on being in the Bitcoin community for a long time to come. With dedicated support, worthwhile periodical contests, and a name that has been around through the highs and lows of Bitcoin, it is highly recommended that a player check out PocketRockets as one of their top options. Bonus Pocket Rockets does not currently offer a sign-up bonus.